Get our Weekly Broadcast Preview, eNewsletter & more! Help Us Send My Evangelistic Books to Millions of Jewish People in North America! Thank you for helping us to reach the Jewish people of North America with the Good News—including Jewish Millennials. 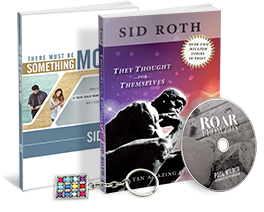 In appreciation of your gift of $77, we will send you a copy of both of my evangelistic books and 7 copies to Jewish people. Want to do more? Reach an entire Jewish neighborhood. Gifts are tax-deductible/tax-creditable as allowed by law and processed in USD. Which emails would you like to receive: You may periodically receive email from us regarding the interests you select. Please review your choices above. By clicking SEND GIFT NOW, your credit card will be charged to complete your donation. Messianic Vision is registered as a 501(c)(3) non-profit organization. Contributions are tax-deductible to the extent permitted by law, tax identification number 52-1081247. © 2019 Sid Roth's It's Supernatural!